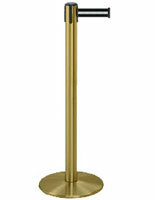 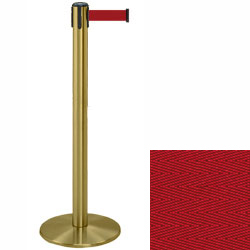 Crowd Control Public Guidance Stanchions-This satin brass Tensabarrier post features a 7 1/2 foot maroon belt. These stantions are a very classy way to guide your customers and clients. These are great for banks, hotels, hospitals, airports, restaurants and bars. 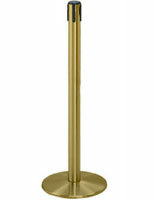 The actual post measures 38" tall, with a 13 1/2" diameter base, and weighs 24 lbs, the belt is 2" wide.